Project obstacles and solutions: The Mill Creek/Opryland Equalization Facility is part of the Cleanwater Nashville Overflow Abatement Program that is aimed at reducing storm water runoff and sewage overflow problems throughout Nashville and Davidson County, Tennessee. When finished, the facility will store up to 19 million gallons of excess water in an above ground tank until it can be pumped back into the system for treatment. This new construction is adjacent to a 15 million gallon tank that was part of the first phase of the project. The Phase 2 storage facility is constructed of pre-stressed concrete using high strength wire, pre-stressing rods and cables. The foundation was poured in one day using 4,550 yards of concrete being fed into four pumps. The pour began at midnight and went continuously for 17.5 hours. IMI dedicated three plants producing concrete at up to 300 yards per hour for this project and made 461 deliveries to the work site. 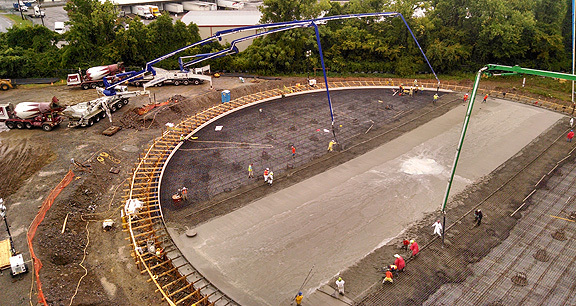 Producing consistent concrete is critical in a pour of this magnitude. Mix components were standardized between the three plants. Any adjustments had to be coordinated from one plant to the other. A major challenge to the mix was the slump of the concrete. The slump is critical to pumping the concrete onto the pour site and keeping it workable for the finishers. In the midst of the job, it rained on and off again for eight hours. Once the pour began, it could not be interrupted. Adding water to concrete to increase the slump can have a major impact on strength. QC/QA personnel were on site to continually monitor slumps throughout the entire pour. As the rain came down, the mix was monitored and adjustments were made accordingly to ensure that the performance of the concrete was maintained. The Mill Creek/Opryland Equalization construction is on schedule to be completed in April 2015.